This is a gouache painting on illustration board created by John Floherty, Jr. for the dust jacket cover of the book, "Death At Their Heels", by Margaret Goff Clark. It is in good condition, with very crisp and clear color, nicely matted and framed in a rustic frame. The sight size of the image is 11" x 16 1/2". The total size of the framed piece is 21" x 25". 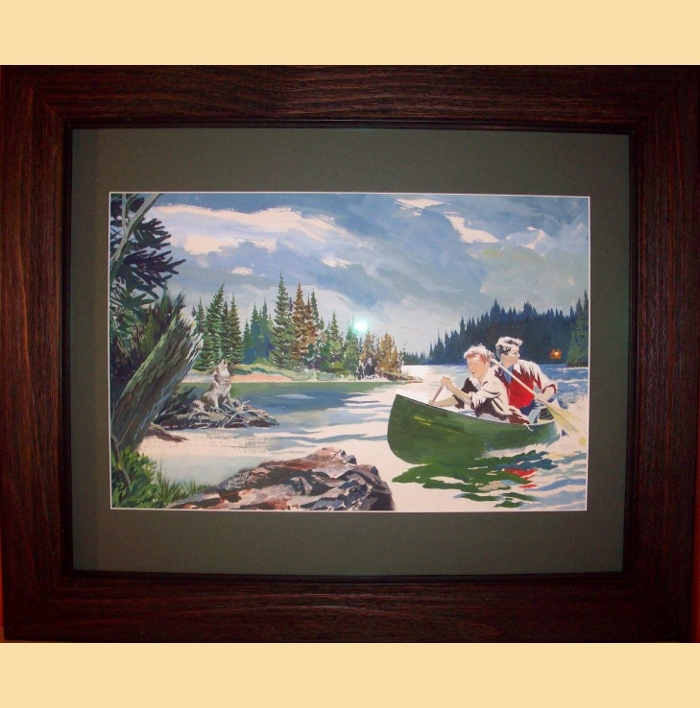 This painting captures the beauty of the Canadian landscape setting in which the story line of the book takes place. The boys paddle feverishly away from danger, as a wolf howls in the background. This is a great image created by Floherty, and is typical of his illustrations, capturing the expression and feel for what was going on in the accompanying story line. Included with the painting is a copy of the book, "Death At Their Heels". John Floherty, Jr. was born in 1907. He studied at Columbia University, the Art Students League with George Bridgman, and at the Grand Central School of Art with Harvey Dunn. He was a member of the Society of Illustrators. Floherty had studios in New York City, as well as in Northport, Long Island. He was an illustrator, commercial artist, cartoonist and painter. He is well known for his poster illustration for the 1958 film, "A Night To Remember", which chronicled the sinking of the Titanic. Floherty did illustrations for magazine covers, including Colliers, Elks, Sports Afield, and Outdoor Life. He also created covers, as well as story illustrations for many books. Floherty also did illustrations for the U.S. Coast Guard publications, including their recruiting posters. He was a combat artist at Iwo Jima and Okinawa during World aWar II. Mr. Floherty passed away in 1977.